Schism is due for release in Summer 2018 by Word Forge Games. Check out www.wordforgegames.com for more details! Schism is a fast paced 'collect or kill' game of celestial warfare for 2-6 players. 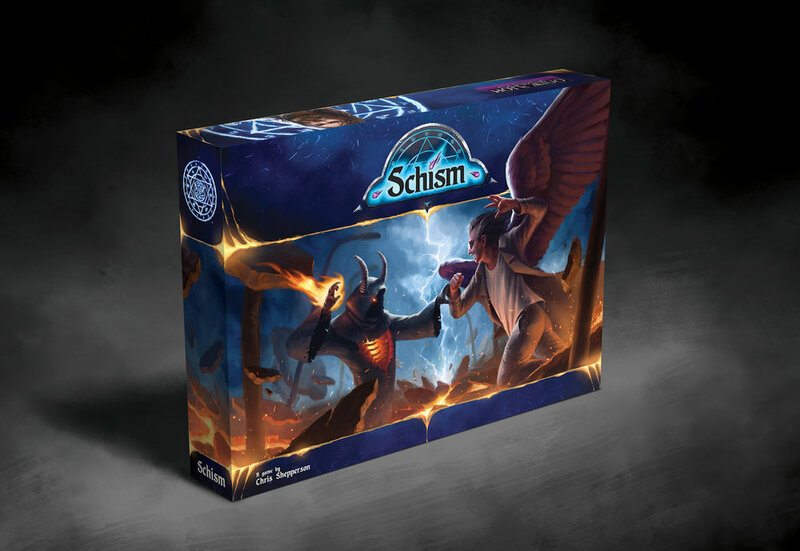 Using grid-based movement over two different realms, Schism utilises dynamic card management paired with an action-point system to give players access to a range of moves, options and abilities each turn. But decisions must be made carefully as some actions will cost you your life force and energy; lose too much and you may find yourself banished to one world or the next. Be the first player to collect 10 Souls/believers or be the last player standing to be declared the winner. There is a war that’s raging, a war between celestial beings living among us on earth. No one can be sure whether there’s a heaven or a hell, but we can be sure that there’s a divide - a divide that will separate us all. Some of them care for us, watch over us and protect us, while others corrupt, kill and manipulate. We assume they have always been here, but now they are making it known. The world as we know it has been changed forever. ‘Angels’ are revealing themselves, gathering followers and building an army of believers to defend against the threats that emerge from the darkness. ‘Daemons’ are stealing souls, building rank after rank of damned warriors, preparing to ravage and consume one realm or the next. These beings have begun tearing each other limb from limb, wielding weapons of fire & light, spreading their wings and exerting otherworldly powers. So, which way will you turn? Influence believers? Claim souls? Slaughter your opponents? Regain your humanity? You decide. Schism, its design, rules, and contents are an original work by Chris ‘Shep’ Shepperson. Copyright © 2017 Word Forge Games.